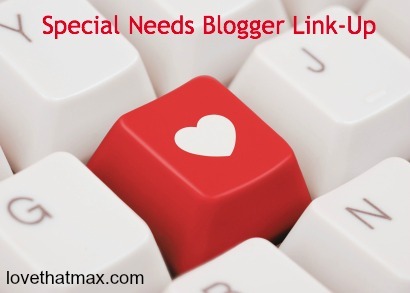 Love That Max : Special Needs Blogger Weekend Link-Up: Yipppeee! Welcome to another Special Needs Blogger Weekend Link-Up, your post home away from home. Share a favorite post of the week—yours or someone else's. This week (at Uncommon Sense) I laid out (with pictures) the ridiculous, invasive, arduous process that we went through to renew our NYC handicap parking permit. Why did they need to see my 5 year old's (normal) brain MRI from 2009 to renew our permit? I can't think of one good reason . . . I think the process needs to change. OUTrageous. Horrific. Just plain crappy. Hell, yeah, that process needs to change. I left some thoughts on what to do. Thanks for letting us share, it makes a difference! Mine is very light-hearted this week! As some of you know, Baker was born with Down Syndrome. At ten months, he is finally cutting a tooth! My addition this week is a guest post, but I think it's so important for parents of special needs children not to assume our kids can't do the very things they watch us do every day - like drive a car! I have not taken the SAT's yet I will in 2 years. My friend w/ an IEP took the SAT's this year and got all the accomatidations she typically recives. Her tip get in contact with your case manager. She was limited to what days she could take it though based on when there would be the staff. I dont know if this varys by state(we are in NY). Thanks, Kathryn! Will pass along. Thanks so much for introducing us all to one another, Ellen! What wonderful folks I've met through your link-ups! This week on Life After IEPs, I'm happy to introduce everyone to Charisse Hogan and her marvelous videos. A disabled man landed up in court for laughing too loudly. In his own home. It made me mad, so I wrote about it. I posted two - one is just a fun Mattel giveaway where your child might win a deluxe Easter basket filled with toys - or a few toys for their basket. Head over and enter!! The other is called "Humility" and it was a personal lesson to me - that it's okay to humble yourself in front of your child's teachers and therapists and admit you were wrong. When you read it, you'll understand. My blog is about March being Cerebral Pasly Awareness Month. I write a blog once a month for my local newspaper called Catching the Curve Balls for parents of special needs children. I am one of about 5 local parents who participate. I repost what I write on my own blog. Thanks Ellen for allowing us to post. I love reading your blog about Max and your family. We are just starting to learn about the Anat Baniel Method and am reading the book Kids Beyond Limits. Hoping this might be something that helps Faith. Ugh... technology! I accidentally posted the whole website's link instead of the post link. I'm sorry! :-/ This week's post gave tips for parents who want to get the most from observing their child's therapy sessions.